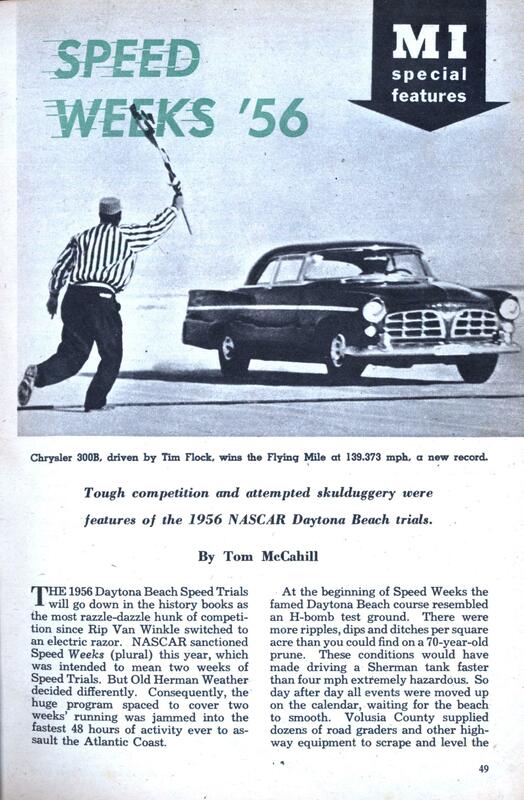 At the beginning of Speed Weeks the famed Daytona Beach course resembled an H-bomb test ground. There were more ripples, dips and ditches per square acre than you could find on a 70-year-old prime. These conditions would have made driving a Sherman tank faster than four mph extremely hazardous. So day after day all events were moved up on the calendar, waiting for the beach to smooth. Volusia County supplied dozens of road graders and other highway equipment to scrape and level the sand but this only partially helped small sections, enough so informal drag races could be held. The only thing to make a good, fast beach was a strong north or northeast wind which at high tide shoots the waves way up and smooths the surface like a brand-new billiard table. The graders worked on and on, night and day through the first week and into the next, but it was Tuesday of the second week, leaving just three days for the trials, before the north winds came and supplied the famous glassy surface needed. The impossible beach caused some havoc, especially in the foreign car entries. Jim Kimberly, Briggs Cunningham with his D-Jaguars, Bill Spear and all the other top sports car men waited out the first week and then had to leave for other commitments. Consequently when the beach was finally right, the fastest sports cars were factory-entered Chevrolet Corvettes and Ford Thunder-birds. As fast as these were, they were many mph from setting new beach records in the over-all sports car classes, though they did establish new records for American sports cars. Speed Week, or Weeks, has changed considerably since the days when I first wrote them up on these pages a few years ago, the days when I personally competed. This year Daytona was jammed with factory men and factory entries which didn’t add to the sport by any stretch of the imagination.” Factory entries are cold, hard commercial efforts to gain publicity and advertising advantages over their competitors. There is no fun involved and everything is as deadly serious as having your income tax reports rechecked by the Federal Men. Some camps protested everything, just as a blanket general rule, and other manufacturers slipped into town just before the official Speed Trials got under way, made special un-official runs with special un-official equipment, only to disappear as quickly from town. The next thing heard from them was that such and such a car “Broke every existing record at Daytona Beach.” This / was blasted over the airwaves and on television. As I was, and still am up to this writing, the Speed Trials Director in charge of the Trials and the inspections, I can assure you such publicity stunts were never inspected and were never official runs. Bill France, president of NASCAR, has now come out with a new and definitive ruling that as of this date no official times will be made with NASCAR sanction on the beach except during Speed Week. As it turned out in one case, a totally unknown young owner won his class after I had tossed out some factory entries for equipment failure. Under our rules American stock cars must have all equipment in operating condition when they start and in operating condition when they finish. If it wasn’t for this rule, it wouldn’t take the smartest mechanic on the block to rig an entire exhaust system so that it would fall off on the first bump, even though it was operating when he started. This would give him •a tremendous horsepower advantage. In all fairness, I had no trouble whatsoever with the really top brass men of various companies. All our beefs came from the jokers only part way up the company ladder. Also, in all fairness, some factories gave us no trouble whatever and acted in general as sportsmen and gentlemen. But with others, I could best describe them by using reverse English on that old slogan about the playing fields of Eton and Harrow: “It matters not how the game is played but only who wins or loses.” It was a lot more fun before the factories showed up. But as long as I have anything to do with the Speed Trials, factory entries won’t receive one single favor that I wouldn’t grant to Joe Blow of Utica..
And there was a lot more friendly rivalry several years ago when, after being pushed around and pushed aside day after day, only a handful of cars were left for the MI Acceleration Runs. This year there was impressive importance in these same Acceleration Trials when 56 inspected production sedans ran in the event with staccato precision. One word about inspection and then I’ll give you the winning results. A cursory inspection was made of all entrants to allow them to run. The first three to finish in each class (i.e., the fastest cars in each event) were completely torn down and this year I invited the factories to have their engineers inspect the opposition. I even had the Ford men supply Chevrolet parts to compare against the winning Chevrolets, and Chevrolet men supply Ford parts to check against their opposition winner. This meant arduous hours of fine miking and hard work, particularly for George Forman, my Chief Inspector, as all the appointed assistant inspectors walked off and left him the final day to go to a party. In fact, George and I, under the eagle eye of a competitor’s factory engineer, were still miking parts of the last car to insure the true winner when the Victory Dinner was an hour under way and the trophies about to be awarded. 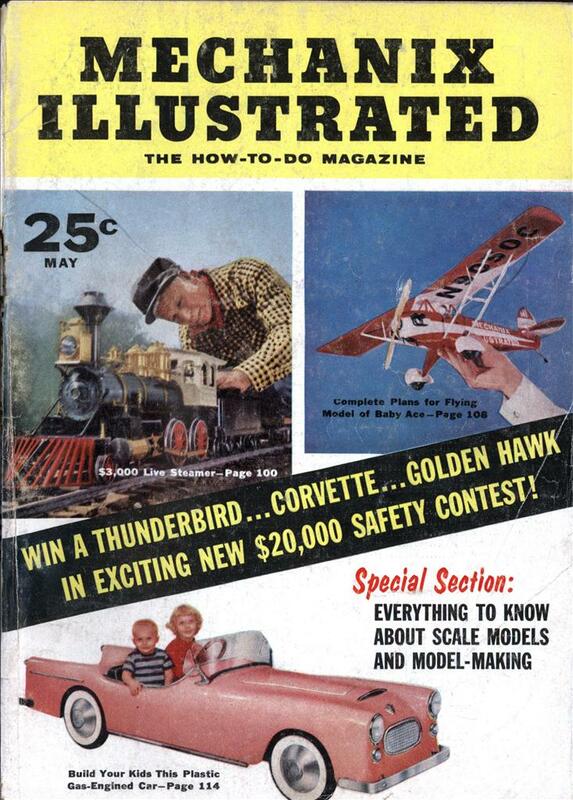 The big events of the Speed Trials were the U. S. Production Car Flying and Standing Miles. The overall winner of the Flying Mile, two-way average, was Tim Flock driving a 300B Chrysler for a new record at an average speed of 139.373. Second in overall standing was Danny Eames driving a ’56 Dodge 500 at an average speed of 130.577. In the small car class, 259-305 cubic inches, Murray Hartley of Erie, Pa., on his first trip to Florida, ran away with the Division at an average speed of 121.335 in a 1956 Chevrolet. In the Women’s Division, Mrs. Vicki Wood of Detroit, driving a 300B Chrysler, set a new record at 136.081. In the Sports Car Division, John Fitch of Stamford, Conn., won the event in a ’56 Corvette with an average speed of 145.543. This is a new American Production Car record but not a new Sports Car record, which is still held by a D-Jaguar that averaged 164 and a fraction in 1955. Also, Zora Arkus-Duntov driving a fully-modified Corvette won this event at 147.300. In the Prototype Class, Vern Haule of California averaged 147.269 driving a prototype Mercury, in spite of the fact that the car was experiencing slight mechanical difficulty. Another outstanding prototype car was the ’56 Plymouth Fury driven by Phil Walters that averaged 136.415, or just under three mph slower than Tim Flock’s record-breaking 300B. In the European Sports Car Class Howard Meeker driving an XK140-MC Jaguar won the event at an average speed of 134.078. Another interesting time was Phil Stiles in an Austin-Healey 100SM with an average speed of exactly 128. For the Mechanix Illustrated Acceleration Trophies, one mile from a standing start, Danny Eames’ 1956 Dodge 500 just beat out Brewster Shaw in a Chrysler 300B when he ran the distance at an average speed of 81.786 against Shaw’s time of 81.762. In the under-305-cubic-inch class, a ’56 Chevrolet was very close to the top large cars and averaged 81.392, driven by Ned Decker of Sherwood, Ohio. In the Popular Price Class, Murray Hartley, whose ’56 Chev won the under-305-cubic-inch Flying Mile, also took this Division at the same time. In the MI trophy runs for Sports Cars, Chuck Daigh of Long Beach, Calif, ran away with the event driving a ’56 Ford Thunderbird at an average speed of 88.779, a new record. This Speed Week was like Old Home Week at Indianapolis many years ago, with all the guys who used to make Indianapolis news now preparing cars for various factories. Men such as Peter DePaolo, Lou Moore and his old driver Mauri Rose, Bill Stroppe, Bill Holland, Andy and Joe Granatelli and Ab Jenkins of Mormon Meteor fame were only a few of the race personalities who wouldn’t have been found dead here just a few years ago. Only one mishap occurred during the speed runs and that was when a Cadillac-powered rear-engined dragster apparently became airborne and flipped during some unofficial warm-up runs. Fortunately “Buckshot” Morris, the driver, was only shaken up. In summing up, the first eight or nine days of Speed Weeks just consisted of a lot of miserable waiting for a tough north wind to blow us a smooth trial course. Many of the real glamor cars failed to run. However, Jim Kimberly did manage to get one Standing Start Mile run in his six-cylinder 4.9 Ferrari which won him the Standing Start Mile for foreign – sports “cars. Betty Skelton made the fastest time ever run by a woman on the beach when she won the Women’s Division for Sports Cars at an average speed of 137.773.